Scorpion has always been the great performer with the reasonable price tag, but what if they decided to step it up and really go after the big dawgs? They've done it before with the EXO- R2000, hitting Shoei right where it hurts. This time, they are going after REV'IT! and the other top track performers with their brand new Scorpion Clutch Gloves. Boom, Superfabric face punch! The Scorpion Clutch Gloves have taken what we love from the SG3s, and just kicked it up a notch, looking for a home on the hands of serious track riders who would rather spend the extra dough towards another tire. They are throwing down the Kangaroo and Stingray Palm for excellent tactile feel without sacrificing protection. Tough but supple Goatskin makes up the rest of the glove, with the welcomed inclusion of Superfabric in many areas prone to see abrasion. Superfabric, which is made of many tiny ceramic panels with intense levels of protection, while remaining more friendly to your precious paint is something we all could use a little more of. Of course the expected pinky sliders and other standard protective features are there, but even a Kevlar lining to dissipate heat has been thought of for this leather beast. 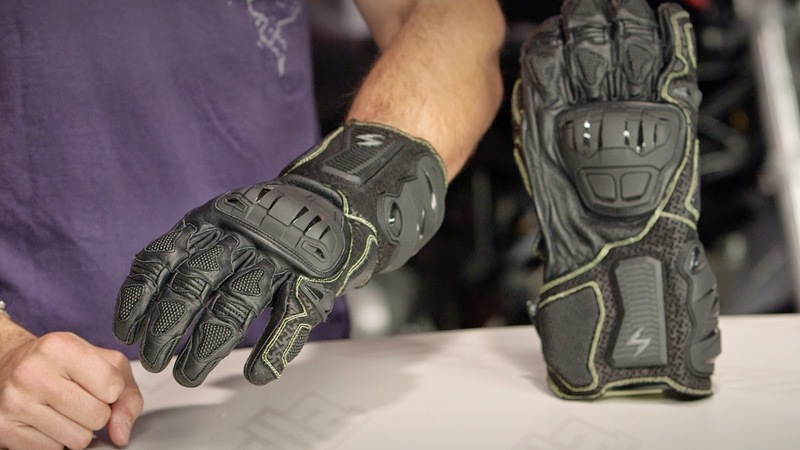 The Scorpion Clutch Gloves could step it up to become a real game changer in the track world. Can Scorpion improve upon their ever popular SG3, and make it all worth it for $100 more? Seriously though, Stingray and Kangaroo palms sounds like we are in store for some exotic surf and turf affordable track glove goodness.